The Ward Activities programme is a direct response to the expressed needs and interests of patients and staff. 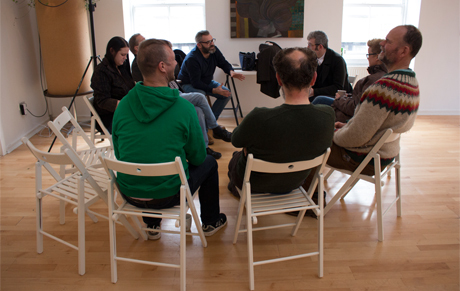 The programme works across both performing and visual arts. 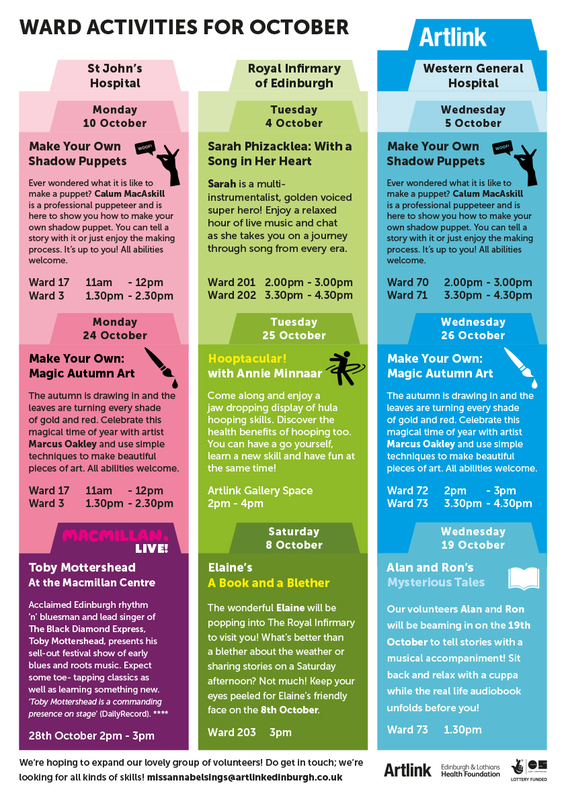 The programme ranges from music, singing, songwriting, magic, comedy, craft and story telling. It has been a real pleasure meeting up with staff past and present over the last year or so to hear more about their connection to the Western General. 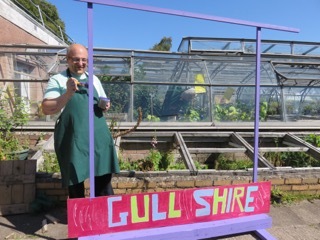 Artlink has been supporting the hospital to ﬁnd ways of marking 150 years of healthcare being provided on the site; from its ﬁrst incarnation as the Craigleith Hospital and Poorhouse to what it is today – a hive of ﬁrst class healthcare on a site that also supports over 80 different plant species. Our meetings have involved copious amounts of coffee, running a half marathon, enjoying the talents of musical medics of the 1960s and meeting some of the folk who were born – and now work – at the Western. The conversations have given a real insight into the strong bonds that form when working in a hospital, and we have also found some pretty decent runners amongst you! These encounters and more can be found on the WGH150 blog. Over the last months we have been working in partnership with The Scottish Book Trust and The Reading Agency to bring Reading Friends to care for the elderly wards. Reading Friends is a UK wide scheme that uses books and reading as a way of fostering friendship and creating meaningful moments that have long term effects. It’s nearly time for the annual staff and patient exhibition! This year it will be taking place in the gallery at the Western General Hospital from 1st March – April 2018. 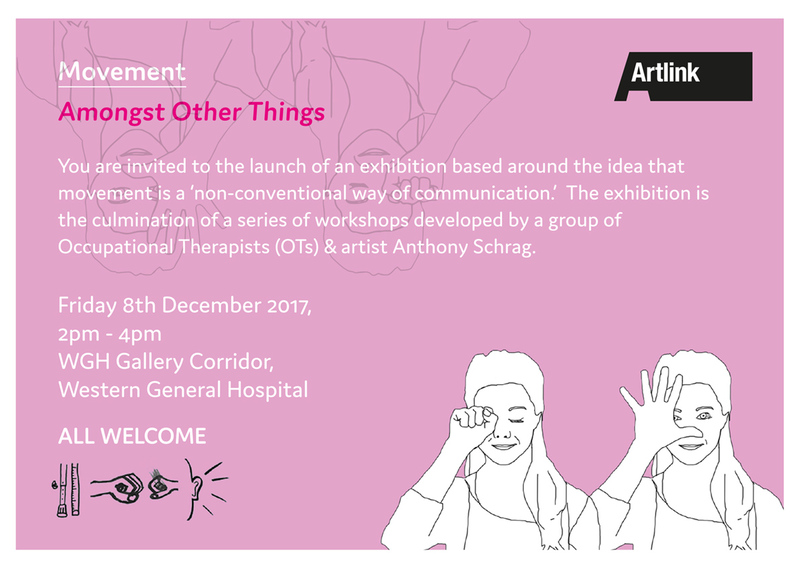 The exhibition so far has been developed by illustrator Laura Cave Macgowan, in collaboration with staff and patients who responded to an earlier call for ideas. She would like to invite you to explore the theme of ‘escapism’ through art, by considering the use of mark-making, lines and pattern in making a piece of work. Perhaps you could take inspiration from what you do to relax or ground yourself. Whether its gardening, visiting a landscape or reading your favourite book, you might want to focus on a detail, such as the surface of a leaf, tiles on a floor, or something more abstract – be as imaginative as you wish! If you’d like to take part, please read the guidelines and complete the submissions form, returning it to us by Monday 12th February. All artwork should be framed and handed in to the Artlink office by Monday 19th February. We’re very much looking forward to seeing all of your unique and creative responses to the theme. If you any questions, then please get in touch. work together and share their experiences. the amazing people we have met and worked with over the years. amazing work giving advice, support and providing recreational activities. 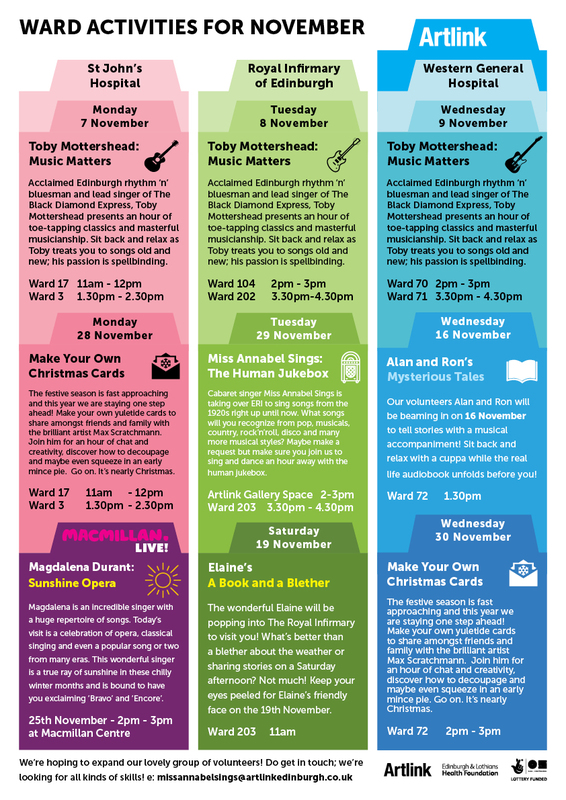 these events are on closed wards and some in public spaces. All events are free. touch with us at Artlink. 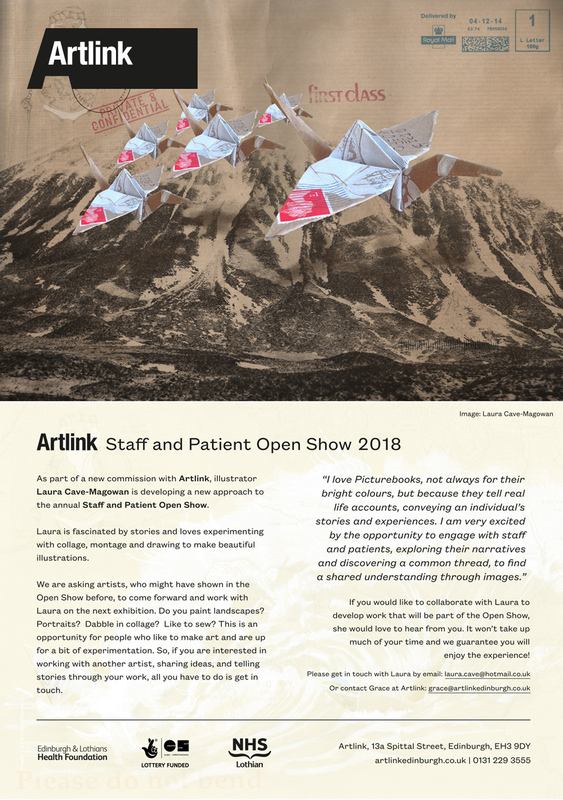 An exhibition celebrating the benefits of live entertainment within a healthcare setting, showcasing Artlink’s entertainment programme on wards. 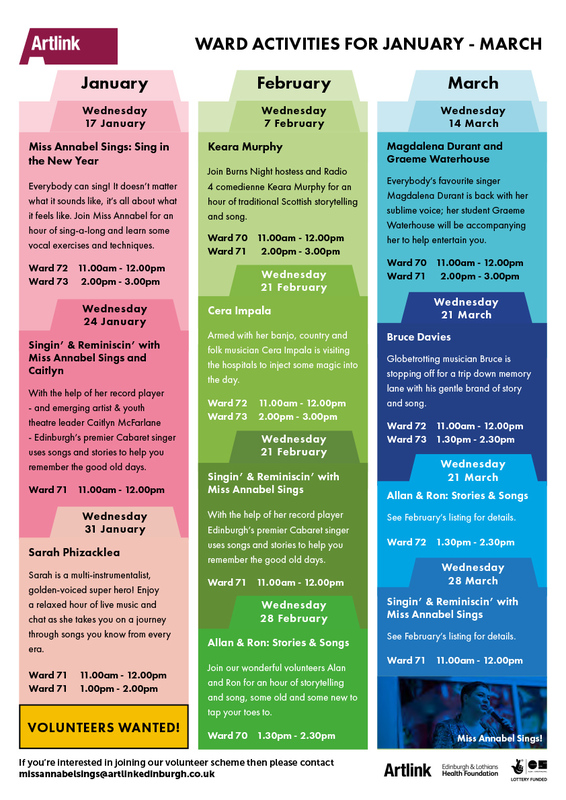 The display presents some of the highlights from Miss Annabel Sings… recent ward activities programme, as well as looking back at archive images from the popular You Dancin…? 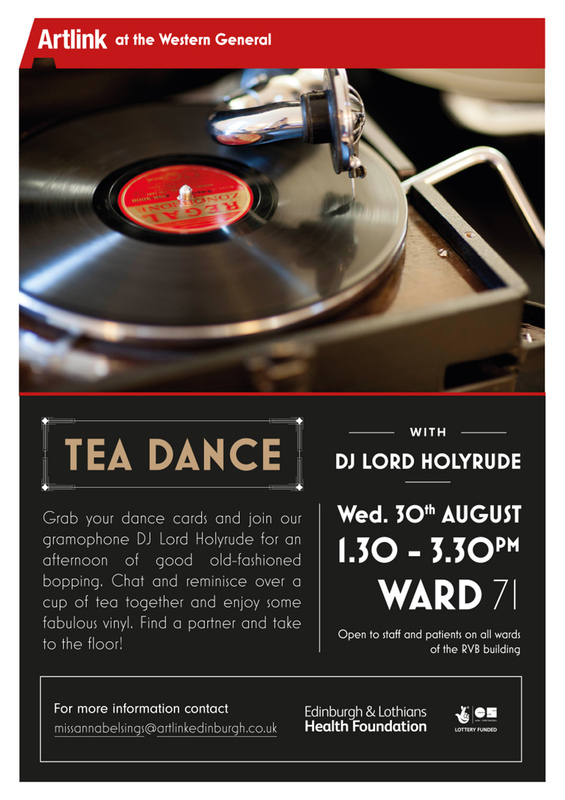 project at the Western General, and Dance a Decade which celebrated the 60th anniversary of the NHS, plus information about the WGH choir. 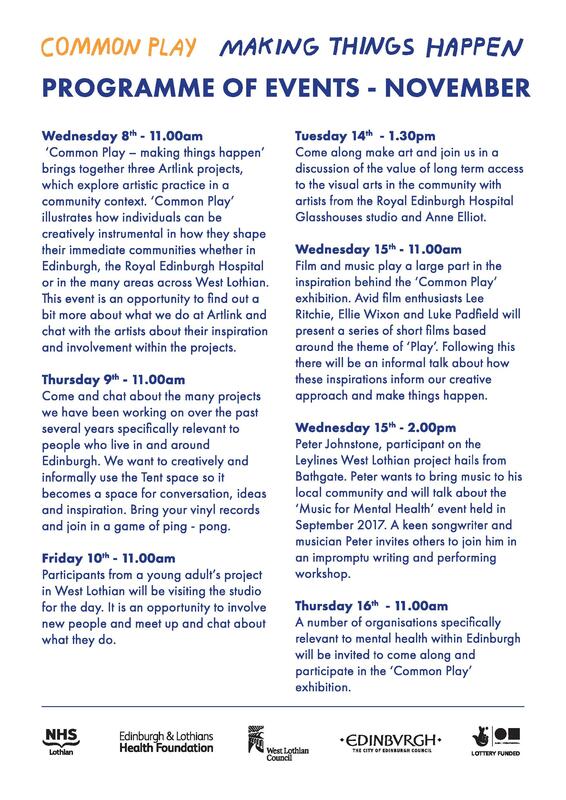 The programme of events will expand around the hospital, including performances in the exhibition space. 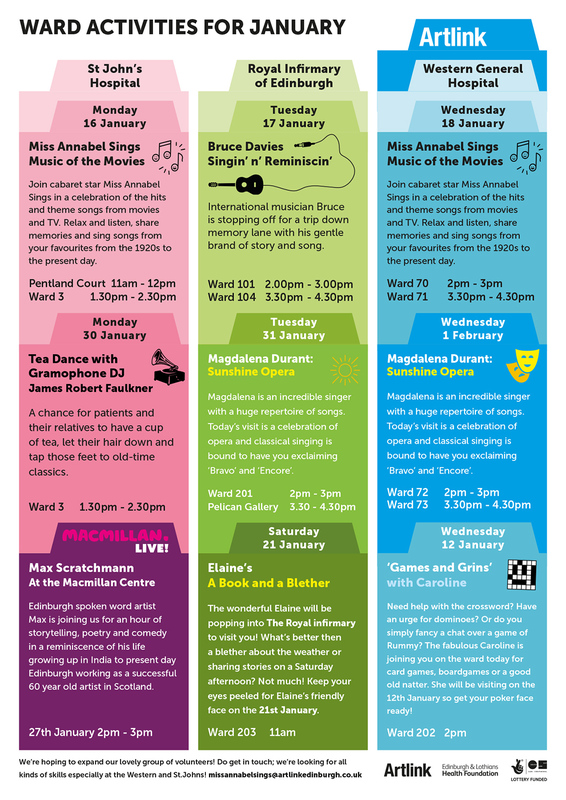 Look out for opera singer, Magdalena Durant performing in the gallery and WRVS cafe in August.